Is it really possible to find true love when you're single...with kids? She was an ex-wife, ex-lawyer and soon-to-be ex-owner if her restaurant didn’t turn around. To top things off, Margo Evans‘ ex was getting married again. What if her two children preferred their new stepmom? But all was not lost. A new lunchtime regular, Robert Brooks, seemed likely to add some spice to her life–or he would if a single mom hadn’t recently left him standing at the altar, wrenching away the child he’d begun to love. Could Margo coax the conservative banker to swallow his fear of women with kids? And show him to a table for four? Try Margo's Daily Soups! Get the recipes from the Extras page. When hearts break, dreams die and a marriage ends, sometimes the idea of loving again feels like an impossible fantasy. Especially when kids are in the picture. Dating is challenging enough without adding the complication of children to the mix. Single parents are busy people. Working, raising kids and running a household all on your own, leaves precious little time for dating. And yet, given the contemporary divorce rate, this is the reality many of us face. I’d like to welcome you to a new series about women (and men) who find themselves in this exact situation. In Love And The Single Mom you’ll meet Margo Evans. Once Margo was young and pretty and popular and full of hopes for her future. She studied law, became a lawyer, married a smart man and had two beautiful children. 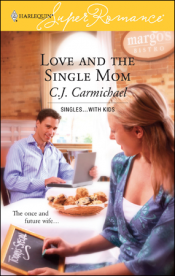 She thought she was living her dream until her marriage snapped over an unexpected infidelity. “Phew. Sorry about that.” Margo sank into the rattan couch next to Nora, after running upstairs to check on the kids. On the table in front of them was the chocolate zucchini cake and a packet of photographs she’d put there earlier. As well as being the mother of an active little boy, Nora had a full time job as a physiotherapist. On top of all that, her sister was living with her but not paying her share of the household expenses. “I’m not sure. Suzanne’s being a little cagey lately. I hope her fiancé knows what he’s getting into. I love my sister. But—"
She didn’t need to say any more. Suzanne was a charming person, but not exactly reliable where money was concerned. “So how about you, Margo?” Nora helped herself to a piece of the cake, then lost no time digging into it. Margo felt a prickling at the base of her neck. Not a creepy, icky prickling, but a sensual, exciting sort of tingle. She pretended to check out the washroom door. Yes, it was the guy in the suit from earlier, only he wasn’t dressed in his suit now, but in jeans and a t-shirt and he looked hot. Suddenly she became very aware of the ambiance in the room. In the daytime, when sunlight streamed in from the floor to ceiling windows and highlighted the lemon tree and the hibiscus, the Bistro’s annex room had the feel of a greenhouse. At night, however, when she drew the ginger-colored curtains and lit the candles, then, the annex was transformed into an intimate, slightly exotic place--a world away from the bustle of cosmopolitan San Francisco on the other side of the walls. “Is he looking this way?” she asked Nora. “He came in yesterday, then again this afternoon. But the answer is no. I don’t know him.” That prickle of a memory just would not take any substantial shape. She wondered if perhaps she justwished she’d met him before. “Would you like another piece of cake?” Margo asked. Nora was already finished her first and was sipping on her chai latte. “Are you trying to be cruel?” No one knew better than Nora the pathetic state of her social life. That was one of the subjects they often talked about--how hard it was to meet men when you had kids and worked full time. Sometimes Margo wondered if that part of her life was over for good. “He is not.” But he was. Margo couldn’t believe it. She set down her fork, but in her nervousness, she knocked aside the photographs she and Nora had been looking at. Several of the glossy four-by-sixes fell to the floor. The hot guy scooped them up as if he’d crossed the room for exactly this purpose. Before handing them over, he glanced at the photos. His eyes widened and his skin paled. The guy had boy-next-door looks, except for his eyes, which were darkly lashed and deeply blue. Right now those eyes seemed to be looking at everything in the room except her. Margo felt her face grow hotter. “Margo Evans,” she clarified. “Robert Brookman,” he said before shaking first her hand, then Nora’s. Robert seemed keenly interested, and Margo sank back into the cushions of the sofa. She’d been right after all...it was Nora he was interested in. Or maybe he’d just been desperate to change the subject. As she listened to Robert tell Nora about a buddy with a sore knee, Margo prayed desperately for Sandy or Edward to call her with an emergency from the kitchen. She’d known Robert wasn’t looking at her. He liked her soups. Not her. Nora told him about a colleague who ought to be able to help his friend, then scribbled a number on the back of one of her business cards. “You should have seen him in his suit.” In his dark blue pin-stripe, Robert Brookman had looked of the same ilk as her ex...a business-obsessed workaholic, who scheduled outings with his wife with less frequency than his semi-annual dental check-ups. Nora’s expression grew sad and Margo knew she was thinking about Kevin. Nora didn’t talk about him much. All Margo knew was that he’d been a cop, killed in a car accident before Danny’s birth. It was a loss Nora didn’t seem fully recovered from. But Margo hoped that she would move on soon. Kids were terrific. A job you loved was great, too. But there were times when Margo longed for more and she knew Nora did, too. With a sigh, she picked up her fork and took another taste of cake. Margo hurried to the other room and slipped behind the counter. No customers were waiting in line at the moment so she had free access to the espresso machine. Sandy was clearing tables, while Edward made a show of re-arranging the goodies in the display case. A few minutes later Margo returned to the annex room with a fresh chai latte for Nora and a top-up to her mocha. “Hopefully your kids won’t have step-siblings to worry about.” Nora was working hard to find something positive to say. “Not to mention the real mother dies in that movie,” Margo pointed out. Margo took a bite of cake and wondered why neither Nora’s comforting words, nor chocolate, seemed to help.